So what if you made a list of the ten things that make you happy? Not the universal stuff like family, friends, holidays and chocolate but the ones particular to you – your own personal happiness recipe – and then try to design a life around it. After reading Gretchin Rubin's The Happiness Project, bestselling New Zealand author and journalist Nicky Pellegrino decided that she should do just that. Not only should she undertake this project, but why not write a novel, based around a character who decides to do just that too. So she picks up her life, and decides to move to Venice. IN THE MAZE OF VENICE'S CANALS, BRIDGES AND PIAZZAS, ONE WOMAN SETS HERSELF A GOAL TO FIND THE TEN THINGS THAT COULD BE THE KEY TO HER HAPPINESS. Addolorata Martinelli knows she should be happy. She has everything she thought she wanted - her own business, a husband, a child. So why does she feel as if something is missing? Then when her restaurant, Little Italy, is slated by a reviewer, she realises that she's lost the one thing she thought she could always count on, her love of food. 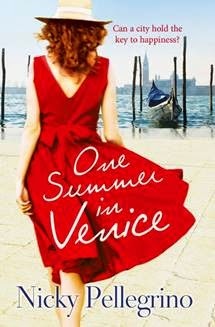 So Addolorata heads to Venice for a summer alone, aiming to find the ten things that make her happy. Once she's found them, she'll construct a new life around her ten things, but will they include her life in London? It was Nicky Pellegrino's Italian father who gave her family a true passion for food. Now living in New Zealand, working as a journalist, Nicky hordes her holidays so that she and her husband can return to Italy to see family, eat mozzarella and research her books. Nicky was the former editor of the New Zealand Women's Weekly, and still works as regular columnist for the magazine. 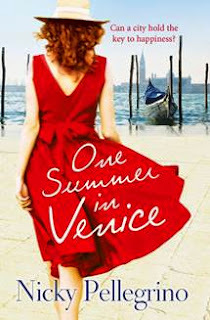 One Summer in Venice was born after Nicky read Gretchin Rubin's The Happiness Project, and decided to try and design her life around it, and create her own personal happiness recipe.